Last Saturday I was invited by Fabb Events to attend their latest blogger event in Liverpool. It was my first blogger event so I was a little nervous as I didn't know what to expect but I definitely had no need to worry as it was lovely and I had a really good time so I'm glad I went. The event took place at the beautiful Pan Am bar/restaurant in Albert Dock, and it was a lovely space to hold the event as we were separate from the rest of the restaurant. Upon arrival, we were promptly given a goodie bag and offered cupcakes but in true blogger fashion no one touched them until everyone had photographed them! There were six brands that had attended the event (Hearts & Bows for Ark Clothing, Lush, Espa, Crystal Clear, Tropic and DermaV10) and they each had a table allocated to them so we manoeuvred ourselves around speaking to each brand individually and received lots of products which I'm very excited to try out! FABB Events even held a little giveaway themselves so you could win a bunch of stuff from Laurens Way and Olive + Frank to name a few. The winners were selected by random over twitter, sadly I didn't win but I already had lots of goodies so I didn't mind. Stupidly I forgot my camera and the photos on my phone really aren't that great, not even post worthy which is a shame but heres some shots of the products/goodies that I took away with me, expect some reviews in the next couple of weeks! 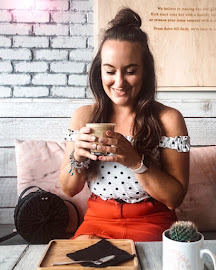 I really enjoyed my very first blogger event and it was lovely to meet some other Liverpool bloggers especially Chelsea from Humble Honesty. Thank you so much to FABB Events for inviting me, I really enjoyed myself and cannot wait for the next one!